Almost all GSA SER users use verified lists for their link building campaigns. Some prefer to build their unique list, and some buy premium lists while others download public/shared lists. By using high quality verified list and stop letting GSA SER scrapes itself for targets..you can experience more power of GSA SER. GSA SER is much faster with verified lists than running with scraping and identifying itself. Do I really have to use a GSA SER pre-verified list? Do I really have to use a GSA SER pre verified list? No, you do not have to use a premium list if you do not want to use maximum power of your GSA SER. You do not have to be a churn and burner or mass link builder to use a verified/premium list. Even you build few links, in white hat way and lite user of GSA Search engine ranker you still have to use high-quality targets.So if you have high quality verified list, you can start posting without any target sorting/scraping hassles. Also, it helps to push strong link juice upward from lower tiers for faster indexing and rankings. When I started to use GSA Search engine ranker ( that was 5 years ago), and I used to rank in google’s top 10 for high competition niches like loan, surveys, work at home, etc…Just running 7/24 GSA SER on a virtual server with a bunch of proxies along with GSA captcha breaker. But, now.. things have changed. That does not mean it is impossible to rank only using GSA SER. Some niches are very easy to rank while others not. Rankings depend on many factors and change constantly. Since Google has stopped updating Page Rank (PR) many SEOs including me replaced it with MOZ metrics such as PA, DA, TF, CF. Having rich domain authority, Page authority backlinks make faster rankings and works similar to PR (like it used to). GSA Search Engine Ranker Tiered Link Building Works And Its Evergreen..Why? Using a ser verified list you can build backlinks fast to lower tiers, and it gives authority power to main tiers that’s one of the benefits having a premium list. Now the real story begins… I decided to write this post with my personal experiences, and I am getting hundred’s of emails every day about premium lists, how scraping works and how to rank, etc. This is mostly happening with GSA SER newcomers. Most of the time (no matter whether you buy a list or build a list by scraping yourself ) verified targets are crap. Thousands of GSA search engine ranker users use same footprints and keywords to scrape/post. Even you buy a pre-verified list it will not be last longer as long as everybody post to same targets. Everyone loves contextual targets.Some users still concern about PR.Also, should filter out bad words. When SER running through a verified list and user has only selected a few of engines (let’s think its for T1 ) and enabled some filters then LPM starting to drop down and getting very less verified links. Ex: If you select in project options to skip over 75< OBL targets ..and if your verified list does not contain much ..you will experience a lack of verified. If your premium list built with different OCR instead captcha breaker you will waste these targets by failing with GSA CB. Here I am not going to write a blueprint “how to build a GSA SER verified list ” since there are many tutorials/youtube videos out there. You can use Scrapebox (if you have Gscraper with their proxy service or hrefs would be better) with Google passed public proxies to scrape, and it is much faster than SER scraper. It is a hassle-free solution.Even there are many vendors who offer verified lists it is important to have a look their services before you purchased. Overselling – Always make sure to check how many copies they are selling per list. You have to find a quality & trusted vendor to avoid over sellings, quality of targets, etc. Unknown targets due to script changes etc. 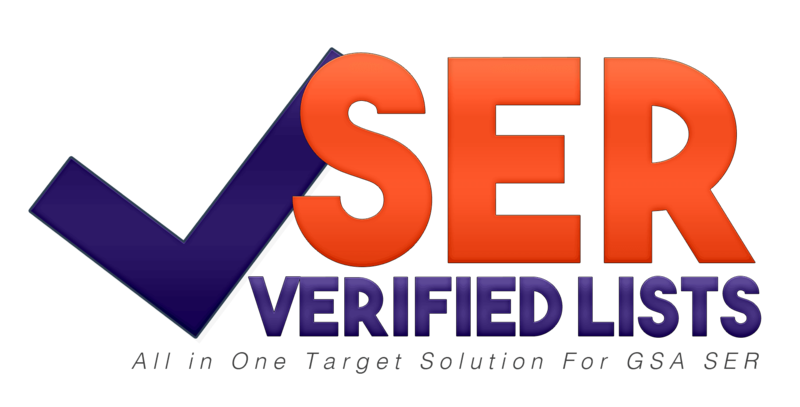 There is a significant difference when compared SER Verified Lists service with a verified /premium list.It is a total GSA search engine ranker target solution.Simple set and forget solution. You do not have to worry about a single thing. You will get fresh; high-quality GSA SER verified targets directly to into GSA SER. You do not have to worry about dead/unknown targets – it monitor every single target in Real-time and if any detect it automatically removes from the list. It is all in one list solution for GSA SER users. Not that because it is one of our services. It is a truly hands-free solution for All GSA SER users and its trusted by GSA SER power users since 2013. We are adding many features to our service such as time-tested GSA search engine ranker templates, account data; realtime google passed proxies, etc.